You have completed the first two elements in the first two modules of this course. Next, you will develop key messages, and strategies to ensure team members are well-trained in the plan. In this video, Sarah Bakker of Field Sparrow Farms talks about their experience with different marketing strategies for grass-fed beef. In this video Mel Foster describes their marketing strategies at Foster Family Farms in this video. In this video Seb Ramirez talks about his experience selling to chefs and other customers. 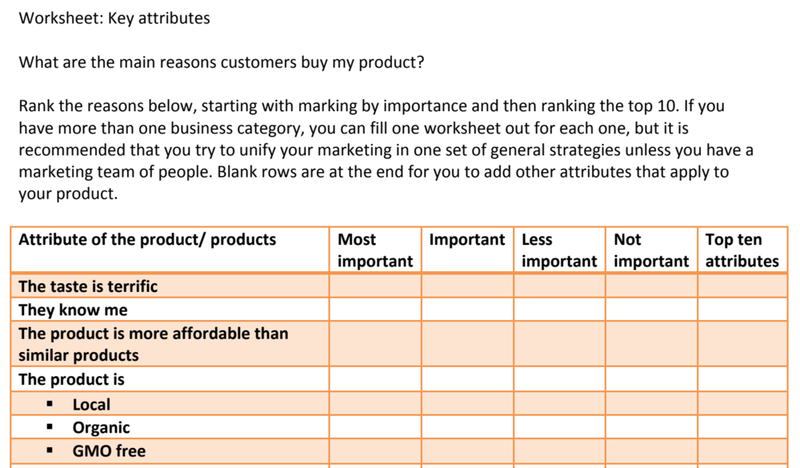 This worksheet helps you sort through the reasons customers buy your products, and to develop messages to meet this focus. Click to view this PDF. This worksheet helps you begin to develop your key messages and materials. Click to view this PDF. This worksheet starts with a prioritization of marketing strategies, from cold calls to billboards. This can be done on your own or in your team. The second part provides space for more detailed message development in your key areas, including style and the resources required (time, cost and expertise) to use these materials effectively. At this point, your target markets should drive your choices. Chefs may prefer to schedule a meeting, talk to you and see some samples, while a retail store may just want a price list, shelf-talkers and a demo. The market research you did in Module 1 should have identified some of these preferences. Click here to view this PDF.